The best of TunnelBear in my opinion is that it is a good VPN with many servers available and their IP addresses are not very "burned" so they are not well known if what you want is to remain anonymous. Technically the application like any other VPN is very simple, maybe even more, because it only lets you choose the country you want to connect to and not the exact server. The connection occurs quickly and I have not had any problem connecting with SSL certificates as some VPN if they produce when using them. The interface is very simple, also beautiful and the map allows you to easily select the country where you want to connect. One aspect that I did not like about TunnelBear is that when choosing where to connect it only allows you to choose a country or zone but the application does not allow you to choose which server or IP you want to use, this way every time you connect to a country the application assigns you a different IP address, this can be a great inconvenience if you are using an application and want to always connect with the same IP address. I recommend using this VPN as a professional or personal user because it works well in all areas, plus its price I think is very competitive for what I have seen in other applications of the same type. I use TunnelBear professionally and personally, I use it professionally to evaluate the behavior of applications created under different IP environments and at home I use it to connect with services that restrict its use to certain locations, especially the United States and leisure content. "Perfecto para saltar bloqueos de internet"
TunnelBear me permite conectarme a paginas que se encuentran restringidas en mi país, dándome la opción de poner realizar registros o suscripciones a servicios a los cuales no podría si no tuviese tunnelBear para ayudarme. TunnelBear me parece excelente en cuanto a la velocidad de conexión, y que no degrada mi enlace de internet mientras lo estoy utilizando, cosa que me ha pasado con otros servicios y de verdad es algo que no buscas en un servicio de VPN. En mi país básicamente todo se encuentra monitoreado, así que TunnelBear me ayudar a mantener mi privacidad de manera rápida y fácil. La versión gratuita permite realizar conexiones limitados por un máximo de 500Mb mensuales, lo cual es perfecto para conexiones rápidas que no necesitan de gran transferencia de datos. Actualmente tienen una promoción con la cual te regalan 1Gb de transferencia si realizas un tweet desde tu cuenta etiquetándolos a ellos. El proceso de instalación es sumamente sencillo y rápido, en cuestión de pocos segundos todos esta listo para ser usado. TunnelBear no cuenta con mucha variedad en cuanto a ubicaciones se refiere, actualmente solo cuenta con un poco mas de 20 ubicaciones diferentes, espero que en un futuro logren tener mayor cantidad de ubicaciones disponible para navegar. La recomendación es verificar para que quieren un servicio VPN y luego verifiquen desde que lugar necesitan estar conectado para poder usar ese servicio en especifico, esto principalmente porque TunnelBear no cuenta con muchos lugares de conexión. "Cambia tu IP a multiple paises"
Visualizar informaciones que no estan disponibles para tu region o pais. Realizar pruebas de aplicaciones, cambiar tu ubicacion geografica. Una opcion bastante buena para dispositivos que deseen locarlizarse en otros paises mediante una mascara de la IP. Es muy util y recomendada para hacer pruebas puntuales. Me parece una opcion agradable, la version paga puede tiene mejores beneficios. En el caso de venezuela existe algunas paginas que no son accesible por medio de esta herramienta puede sacar un provecho. Probar aplicaciones en dispositivos que no estan disponibles en tu region. Enmascarar la IP de tu proveedor de servicio. La conexion es rapida y puedes elegir diferentes localidades. Probar herramientas de otros paises, evitar bloqueo de paginas web que requieren ser vistas. Simular un equipo en otra region. "It is an good VPN, it is very easy to use, fast and efficient. " Its interface is very easy to use, it is light, it does not occupy much weight in the device, it exists for several pc and mobile devices, as well as Windows and Linux operating systems, it is very useful when you need to navigate and find information of any institution in abroad or need some anonymity when making a transaction, the rest is efficient and quality also has a free version of 500 Megabytes to test their functions and is renewed every month and its cost is accessible. Sometimes it tends to disconnect in certain IP and the case may occur that there is some network traffic, since they are public IP, also the other bad thing is that it does not have a private IP address and can cause slowdowns when navigating what reduces the experience to the Usor the product, also does not have more functions with respect to privacy, but if you consider that it is relatively simple which adapts to any user. Good VPN that provides basic features, very easy to use and an accessible price which allows access quickly and is not heavy, can also be used in mobile devices which allows to extend the use of it. It has allowed to create a certain level of anonymity and to access websites of indole investigavo such as universities and research institutions, as well as to carry out some transactions which require certain anonymity but not so frequently, because their protocols are somewhat limited in terms of security, rather what is often used for my personal use but also in some managements behind the organization. "A strong and powerful VPN"
An easy to use interface and shake strong encryption make this release free VPN a strong decision. TunnelBear utilizes OpenVPN as a matter of course, combined with the most developed, uncrackable encryption. Tunnelbear more than once expresses that your browsing action is "ensured by a bear," utilizing an unusual looking toon bear to outline that point again and again. Despite the fact that TunnelBear's free arrangement is little, it gives you a chance to look at the application and complete a couple of speed tests without anyone else. I imagine that is certainly a check for the supplier. Tunnelbear is tied in with influencing VPN to use as simple and available as could be expected under the circumstances. They give streamlined applications to Windows, Mac, Android, and iOS. There's additionally a browser expansion for both Chrome and Opera, and a tracker-blocking augmentation that compliments the greater part of their services (or can be utilized without anyone else). 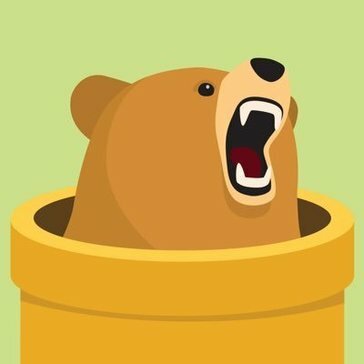 TunnelBear doesn't support introducing its VPN programming specifically on your switch. On the off chance that you weren't anticipating doing this at any rate, it's no major ordeal. However, in the event that you're thinking about utilizing a VPN thusly for the expanded security and usability, you'll have to discover another supplier. It's conceivable that there are approaches to get around TunnelBear's forbiddance. Be that as it may, it's less demanding when the supplier just supports what you're endeavoring to do. Depends on how you want to use it for ,However, in the event that you require more than that, you'll most likely need to pick another VPN. On the off chance that you need choices and customization past what's offered here, for instance. Or on the other hand on the off chance that you need to stream or downpour. "TunnelBear : The Ultimate secure fast VPN"
I like the security and ease of connection to any region the most of all features of TunnelBear. One more thing I would like to mention in pros is the Graphical User Interface. The cost ranges from $5-$10 per month which is totally worth it! TunnelBear provides only 500 MB of browsing data per month for free users. If you are in need of VPN everyday, TunnelBear is best option for you. It takes care of your online security along with supporting you with the pocket friendly premium features. Just give it a try and you will get used to it. I have hence achieved good amount of security while surfing on internet. TunnelBear further helped me stay safe from cyber criminals by making my identity abstract in ocean of websites. "Great VPN for computer and mobile"
For a secure connection the best thing is to use TunnelBear, it is one of the best VPN services that there is right now in the market, we can make a tunnel to any part of the world and navigate in an unknown way without putting all our personal data at risk. The only bad thing is that TunnelBear does not collect the records, I would like to know where I have connected before to not repeat IP addresses, the tunnel in Canada is the most tedious due to the P2P laws of that country. Sometimes we improve connection speed when we use TunnelBear, a great application and our employees play with the tunnels to go unnoticed with some clients that we want to hide our IP from. Good encryption and no logging are some of the biggest advantages of TunnelBear. Thanks to this, we can move around on the Internet without any worries. Another advantage of Tunnelbear is having a killswitch. At the end of our transmission limit, VPN will automatically turn off. A big advantage is also 500MB, which we get for free at the beginning. This is not much, but for someone it is enough. The simplicity of use of Tunnelbear is also very important. The client is so easy that nobody should have problems with him. The biggest disadvantage of Tunnelbear is its speed. During use, the speed of our link often slows down. Another disadvantage is the small number of locations. There are only 20 of them. The last biggest drawback is the lack of LiveSupport. The Tunnelbear team can only be contacted by emial. Tunnelbear due to its simplicity and good price is quite a good VPN, which enables safe use of the Internet. It would be even better if not for its link speed. Its interface is anything but difficult to utilize, it is light, it doesn't possess much weight in the gadget, it exists for a few pc and cell phones, and also Windows and Linux working frameworks, it is exceptionally helpful when you have to explore and discover data of any foundation in abroad or require some obscurity when making an exchange, the rest is effective and quality additionally has a free form of 0.5 gb to test their capacities and is reestablished each month and its expense is available. Once in a while it tends to detach in certain IP and the case may happen that there is some system activity, since they are open IP, likewise the other awful thing is that it doesn't have a private IP address and can cause log jams while exploring what decreases the experience to the Usor the item, additionally does not have more capacities regarding security, but rather in the event that you consider that it is moderately straightforward which adjusts to any client. Great VPN that gives fundamental highlights, simple to utilize and an open value which permits get to rapidly and isn't substantial, can likewise be utilized in cell phones which permits to expand its utilization. It has permitted to make a specific level of secrecy and to get to sites of indole investigavo, for example, colleges and research foundations, and also to do a few exchanges which require certain namelessness yet not all that every now and again, in light of the fact that their conventions are fairly restricted as far as security, rather what is regularly utilized for my own utilization yet in addition in a few administrations behind the association. "it fulfills its function very well "
"TunnelBear, excellent VPN for safe browsing on the network." When you need to surf the net, hiding your Ip the best option is to use a VPN. But in the market there are many that have flaws and are expensive. TunnelBear is different; Its price and quality are without equal in the market. The servers are safe and never gives problems. I really do not dislike anything, all the capacity of TunnelBear meets all my expectations. I would recommend TunnelBear for all that company or user that needs to work safely in intener, without fear that someone is expiating it. Sometimes you need to contact clients in a safe or anonymous way, TunnelBear is the definitive solution for this, not so much in connecting with the servers and you are sure that no one is expiring when you contact these clients. Easy to open and run with just a click of a button. Since I just need it once a month the free version works great with enough MB's to spare. I can't think of any down points at this time. Highly recommended especially for users that use 500 MB or under per month to fulfill a few tasks... because it's free! I'm able to access a country restricted page for work and it allows me to complete the monthly tasks in which I use it for. "A reliable and efficient vpn service. " TunnelBear provides quickest and most efficient vpn service. We can easily get connected to a virual location within few clicks. The free trial also give it a shot to gain user trust. Virtual location enables me to get access to all the remote websites and datacenter which are not allowed in our region.. Most of the locations are locked in free trial version. It's paid version is quite expensive and all these hectic is not even worth paying. I have been using it gain access to all the blocked sites and data center, It enables my approach to remote content. "TunnelBear VPN service allows free browsing to any stuff in the internet." I like the feature which allows changing the proxy location so easiliy using the TunnelBear. I dislike the fact that it doesn't give much features on the free version. I just use TunnelBear to access various websites in China and Europe to search research paper. Some benefits that I have realized is that its very easy to setup. "“Beary” good VPN Service "
Tunnel Bear is pretty easy to use and has a really fun, cheery aesthetic. It’s really cool looking and that’s one reason I enjoy using it. The interface for adding free data credit via Twitter could use some updating. Currently I am using Tunnel Bear to maintain privacy. It's a very good VPN if you're looking for high speeds and high security. "TunnelBear - The Best VPN?" Tunnelbear has a very nice transparent interface and is available on all platforms. By using a strong 256-bit AES protocol, I can safely use the internet wherever I am. I recommend to use the free 500 mb first. Thanks to the tunnel you can safely use the Internet wherever I am. "TunnelBear is a Real Scare"
I did not like this product at all; it seemed to make my laptop susceptible to viruses. This program seemed to compromise my laptop's privacy and safety and after using TunnelBear, my laptop got a virus. I have solved no problems using this software. I have realized no benefits using this software. * We monitor all TunnelBear reviews to prevent fraudulent reviews and keep review quality high. We do not post reviews by company employees or direct competitors. Validated reviews require the user to submit a screenshot of the product containing their user ID, in order to verify a user is an actual user of the product. Hi there! Are you looking to implement a solution like TunnelBear?